1. It’s just plain wicked cute. Srsly. 2. It comes in my favorite color, robin’s egg blue (they call it aqua but whatevs). 3. I can use my shutter for so many things in my scrap room – a place to hold washi tapes, photos, handmade cards, memorabilia, tickets, that kind of thing. And in the bedroom to hang jewelry. And in the kitchen to leave notes. It’s endless, I tell ya’! I hope you will take my request into consideration, as I REALLLLLY REALLLLLY want one, Scrap Santa! If I were speaking to you in person, I would be shaking you by the furry lapels so you would understand!!! OH. UM. Okay, I’m sorry. I have calmed down now. But I still really want the WRMK Shutter Memo Holder. Pretty please, Scrap Santa???? OKAY. Letter done. Now I can get on with business. 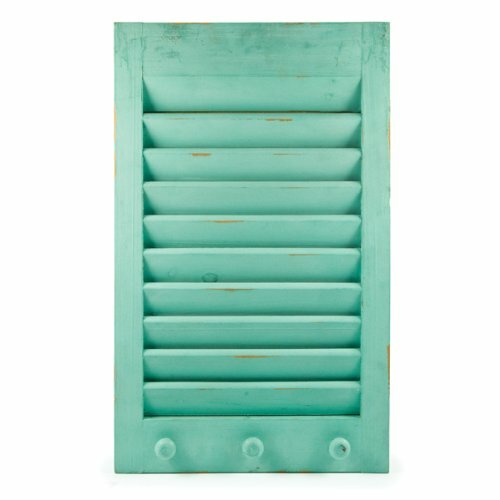 These shutters retail for $39.99, I’ve seen them elsewhere for $35.99, but at Amazon they’re only $25-26 (depending on color) and free 2-day shipping if you have AMAZON PRIME . I’m not sure why the shipping time is 3-5 weeks but that’s what other vendors are showing, too. Maybe the WRMK folks don’t go out and chop down the tree to make the shutter until they have your order firmly in hand, IDK. Oh well, still plenty of time for Santa to put it under my tree! It comes in several other colors if you’re weird and don’t like the best one I’ve chosen above ;) You can see them all HERE . Now, off with you! Go write your Dear Scrap Santa letter and get one of these babies under YOUR tree! ETA: Oopsie! AFTER hitting Publish (of course), I re-read my post and it’s a bit contradictory to tell you there’s free 2-day shipping on an item that says it takes 3-5 weeks to ship! Sheesh. Sorry ’bout that. But shipping is free with Prime! Thanks for the above, Well, it is getting close. Any day now really. I was making a list of the pictures I want my mom/sisters to take and realized that I only have like 10 poses. I am a scrapbooker and would really like to dedicate a whole scrapbook for the “hospital experience”. So, I am turning to my fellow YA moms for ideas and suggestions! Anything would be greatly appreciated. I would definitely rather have a picture and end up not using it for her scrapbook than really wish that I would have gotten a pic not have it! Well you what this means – you have to behave for the rest of the year in order to get this! LOL!! Don’t know if I can but this is worth it :) Hope you get this beautiful shutter home decor! !